MORGAN RUSHWORTH PBXS CNC 4100/300 Hydraulic Downstroking Press Brake. Year 2014. HURCO TM8 CNC Lathe with Max Control. Year 2008. MIYANO BNC-34C2 CNC Lathe with Fanuc 21-T Control. Year 1997. MAZAK Integrex 60 - 1500C CNC Chucking Lathe with Mazatrol T-32 Control. Year 1992. MAZAK Integrex 40 CNC Lathe with Mazatrol T32-3 Control. Year 1994. XYZ ProTurn 350 CNC Lathe with ProtoTrak LX2 Control. Year 1998. COLCHESTER Tornado A90 CNC Lathe with GE Fanuc 21i-T Control. Year 2000. HARRISON VHS 450 Gap Bed CNC Lathe with Fanuc OT Control. MENTI Tornio Model 214 CNC Lathe. Year 2003. COLCHESTER Tornado 310 CNC Slant Bed Lathe with Fanuc 21i-T Control. Year 1998. HAAS VF2 Vertical Machining Centre. Year 1995. HURCO VM1 Vertical Machining Centre with Max Control. Year 2002. BRIDGEPORT 760 Vertical Machining Centre with Heidenhain Control. 4th Axis Attachment. Year 1994. CINCINNATI MILACRON Arrow 500 Vertical Machining Centre with Heidenhain Control. Year 1997. BRIDGEPORT VMC800/22 Vertical Machining Centre with Heidenhain TNC410 Control. Year 1998. BRIDGEPORT 1000/22 Vertical Machining Centre with Heidenhain TNC370 control. BRIDGEPORT VMC800/22 Vertical Machining Centre with Heidenhain TNC370 control. Year 1996. BRIDGEPORT VMC760/22 Vertical Machining Centre with Heidenhain TNC370. Year 1995. XYZ Pro3000 3-Axis Turret Milling Machine with ProtoTrak MX3 Control. Year 1996. COLCHESTER Mascot 1600 Gap Bed Lathe with Newall DRO. COLCHESTER Mastiff 1400 Lathe. AMADA SP30 Punching Machine. BRIDGEPORT Turret Mill with Acu-Rite DRO. THOMAS Model 275 Super Cut-Off Saw. GIDDINGS & LEWIS Model MC Endomatic Facing & Centering Machine. BATY R11 Shadowgraph with DRO. MAS VR64 Radial-Arm Drilling Machine. Complete with 2 box tables. CRAVEN Heavy Duty Centre Lathe. LANG Model 14/A4 39H Bullet Head Type Heavy Duty Lathe. LANG Bullet Head Type Heavy Duty Lathe. CRAVEN Heavy Duty Lathe. FELLOWS 61A Gear Shaper. CNC / MACHINE TOOLS Matsuura RA-1X CNC twin pallet VMC (2004). Vanco Flexiband 24 linisher, Raybrook honing machine, Vulcan Engineering F1000135-25 fettling grinder (2012), Jones & Shipman vertical cone grinder, Boxford VM30 milling machine, Senior horizontal milling machine, Startrite T30 spindle moulder, Axminster AWDS12H disc sander, Wadkin Bursgreen C582329 horizontal bandsaw, Hammer N4300 vertical band saw, Ward No2 Scholar capstan lathe, Sameca MU2.5.6 bar feed, Taboni Tabre 160E insizer & marking machine, Tool Master II-D tool pre-setter, Qty small tooling / inspection, etc. FACTORY PLANT / MISCELLANEOUS Mitsubishi PUHZ-ZRP100YKA3 air conditioner (2017). Scania 420 flatbed crane lorry, 51reg. Toyota Rav4 Xt-R D-4D car, 11reg. Deutz 6 cylinder, air cooled diesel engine in GPU, Yukon YXL150 petrol Quad, Flemming 6ft topper, Propen P3000 bench type marker (2003), Bambi PT50 compressor (2017), Dalmec PRS manipulator (2000), Benson PV50-1 gas heater (2017), Boy 30T2 injection moulder, Clarke SB30 shot blast cabinet (2015), IHE 3170 induction heater, Carel Humisteam Xplus humidifier, vacuums / hoovers / cleaners, 2x Busch vacuum pumps, granite surface table, vacuum tray forming table, hydraulic lift platform trolley, dust extractor, Qty various cable, safety barriers / cleaning signs, pallet racking, lifting chains, steel work stands, consumables, etc. SHEET METAL / PRESSING Kinghorn 240 ton mechanical downstroking power press, SMT 1/2â&#x20AC;? hydraulic guillotine, S&B No3 & Norton 4DB flypresses, BOC Transarc 400 welder, Miller SR-150-32CY50 DC welding machine, arc welders, Gosmeta EPR/40 eccentric press, etc. FURNACES Meltech Strand 6 zone annealing furnace (2010). Meltech Strand 7 zone annealing continuous rod & wire furnace (2008). Furnace Services lead bath furnace. W H AT â&#x20AC;&#x2122; S H A P P E N I N G ? Ford Transit Custom Panel Van (16/16); Transit Custom Double Cab Panel Van (15/15); Transit Connect Panel Van (15/15). (x2) Vauxhall Vivaro Crew Cab Panel Vans (64/14). Volkswagen Caddy Startline Panel Van (64/14); Caddy Maxi kombi (61/11); Transporter T28 Panel Van (08/08). Mitsubishi L200 4LIFE 4WD Pick Up (02/02). Cars to include BMW 120 M Sport (12/12); VW Golf GT (61/11); FORD Mondeo Titanium (2012). Dave has worked for the Company since 1998, having previously worked for Edward Symmons and has plied his expertise throughout Europe. He specialises in IT hardware, Audio Visual Equipment, Contractors Plant and Commercial Vehicles amongst other sectors. Dave is currently advising the Administrators on aviation spare parts for the Fly BMI case and has recently been handling the sporting trophies formerly held by Boris Becker; he also advised on the Dell Super Computer at the Caterham Formula 1 teamâ&#x20AC;&#x2122;s premises. When not rebuilding houses for family members Dave is keen to relax fishing from the stern of his narrowboat, or travel in South Africa. Mark claims he is the new recruit to the team, having worked for Wyles Hardy since 2005. He is a Registered RICS Chartered Valuation Surveyor and previously worked for Henry Butcher and headed up this specialisation for Savills. Mark has ventured to Kenya, Spain, Mexico and Panama whilst with the team, and has in the past wielded the gavel for the MG Rover Sport & Racing broadcast online auction. Mark enjoys working in a wide variety of sectors including high value classic cars, intellectual property rights, food and packaging machinery. When off duty from being the taxi driver for his daughter Mark enjoys the challenge of keeping his Series One Land-Rover going on and off the road. APRIL 24th ON LINE AUCTION To Include; 40 PLUS LOTS : 2016 Ford Ranger Wildtrak Double Cab 4x4 Pickup, 2008 Mercedes Econic CARP (Combined Aerial Rescue Platform) 6x2 Aerial Work Platform / Fire Appliance, 2007 Ford Transit 16 Seat Minibus, 2009 Iveco Daily 65C18 3.0 HPT Long Wheel Base High roof panel van, 2003 Land Rover Defender 130 Access Platform / Cherry Picker, 2007 Citroen Relay 7 Seater Double Cab Dropside Pickup, 2014 Caterpillar TH414C GC 3.6 ton Telehandler, New & Unused Volvo EC210B LC Prime 22t Excavator, New & Unused Case 770 EX Magnum Backhoe Excavator, New & Unused Manitou Terex TLB844S Backhoe Excavator, 2007 Nooteboom OSDS-48-03V Extendable Tri Axle Low Loader Trailer, Oldbury Tri Axle Sliding Deck Plant Trailer, King DT99 Draw Bar Plant Trailer, Utility International ZT3FLS 44ft Tri Axle Curtainside Trailer, Penman General Lightweight Trailer, New & Unused McCormick C100 Max T3 Tractor, Valmet 365 Utility Sweeper Tractor, 2014 JCB Workmax 4WD Diesel Utility Vehicle UTV, 2016 Polaris 6x6 800 EFI Ranger Utility Vehicle UTV, Hunter 8 Wheel Amphibious ATV, Countax Rider 30 Ride on Lawn Mower, Simplicity Baron Ride on Lawn Tractor, Countax C400H Ride on Lawn Tractor, Countax C800HE Ride on Lawn Tractor, Ransomes Parkway 2250 Triple Gang Ride on Mower, Beaver P9 Flail Hedge Cutter etc etc. To include: Items under Instruction from two National Plant and Tool Hire business’s; BRI the Liquidators of D&S Mechanical Ltd; Due to retirement and closure of a local Garden Machinery service, repair and supply shop; Items under Instructions from a Nationwide Tool Supplier; Kubota ZB7000E two wheel drive mini tractor; Also Garage & Woodworking equipment and much more! RSL VEB Hot Asphalt Recycling Plant, 2 x 20 ton hot boxes, Terex MBR71 pedestrian roller, 2 x Atlas Copco TEX230PE Breakers (2015), grizzly bars, A range of workshop & office equipment. This will be a timed online auction on the I-Bidder and Bidspotter Platforms. Viewing for this auction will be at Their Trading Premises, Unit 1 South Orbital Trading Park Hedon Road, Hull HU9 1NJ on 23rd April from 10am until 4pm 300 Lots will include, Samsung, LG and Other TV and Audio Equipment, Creston Audio and Video Components, Cat 5, 5e,6 and 7 Cable and Fittings, Sonus TV and Other Brackets, Hand and Power Tools, Fiber Optic Fittings, Office Furniture, Lap Top Computers, Dell Desk Top PC, HP Printers and Plotters, Etc…. 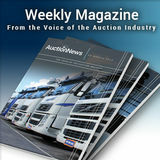 Catalogues for auctions are available online at www.cwharrison.com Sales held under instructions received from Liquidators, the Insolvency Service, HCEOs, HMRC, Solicitors, under distress warrants for rent & other sources. Conditions of sale are available at www.cwharrison.com & in the printed catalogue. ID required to bid. has a significant online offering which provides both vendors and buyers a wider opportunity to reach each other. The business has continued to be successful in acquiring new contracts, notably with government agencies including local councils, police forces and Border Force. It has strengthened its fleet sales with major vendors including STB Bank, Lookers, Motability, Volkswagen Group, Eastern Western Group, Arnold Clark and many others benefiting from the expanding network of auction facilities. Wilsons Auctions continues to expand and innovate, in 2019 Wilsons Auctions launched its first Bitcoin auction and other virtual currencies for various European government agencies. 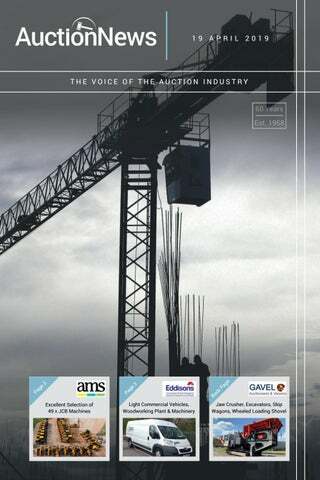 A family owned business, Wilsons Auctions was formed in 1936 in Northern Ireland and has grown to become the largest independent auction company in the British Isles with sites in England, Northern Ireland, Republic of Ireland, Scotland and Wales. For further information go to www.wilsonsauctions.com, follow on Facebook @wilsonsauctionsltd or go to @wilsonsauctions on Twitter and Instagram.